These one bedroom apartments on the prestigious Lago Verde complex are a perennial favourite with our clients and overlook the picturesque fishing port in the old town area of Puerto del Carmen. 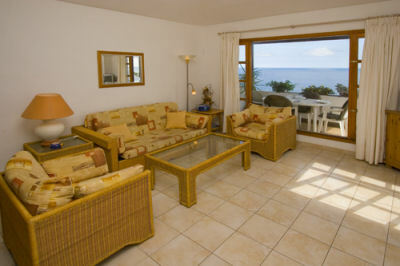 Each of the stylishly furnished apartments has a large sun terrace designed for enjoying the magnificent views of the ocean along the South coast of Lanzarote. 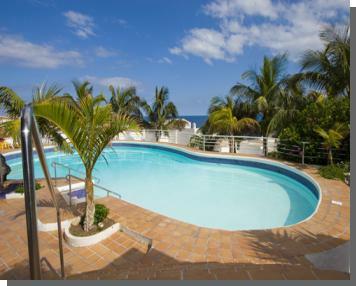 Guests at Lago Verde will find a snack bar conveniently located next to the attractive swimming pool and sunbathing terraces, shops, bars and a superb selection of fish restaurants are all within 5 minutes walk; sandy beaches are around 15 minutes from the complex. The accommodation sleeps up to 4 and comprises; attractive and well furnished lounge with Satellite TV (limited channels) and picture window, leading to balcony or terrace; modern, well equipped kitchen with electric hob, oven, fridge, kettle, toaster, iron and breakfast bar; 1 twin bedroom; well appointed bathroom with twin hand basins. The pool is acclimatised during the Winter months only.